The Job Board theme equipped you everything to build a powerful job board site with an absolutely simple way that is a result of years in searching and development about the Job Board Industry. Jobmonster keeps going with continuous updates to be one of the best job board theme always. Since being launched, the theme attracts more than 3000 happy customers as well as tons of kind words which motivate us to develop the theme to be better and better on every update time. 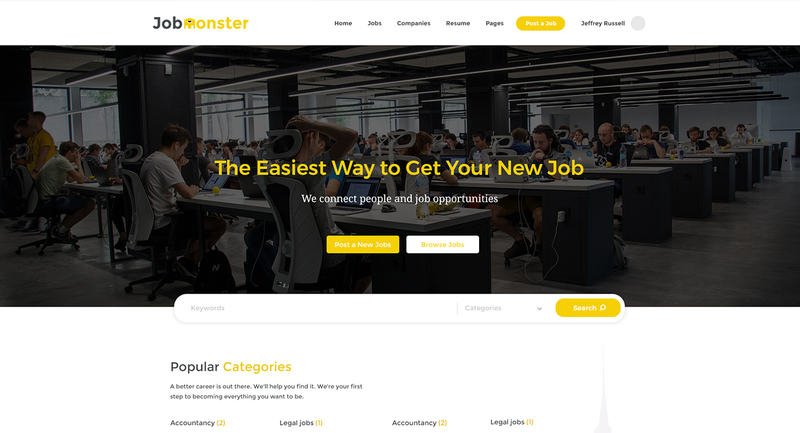 Here is a complete video which will guide you each specific step to build up your site with Jobmonster, Furthermore, the video also gives users most of the essential configuration of Jobmonster. Hence, you still get everything you need for your complete job board site. JobMonster now offers a new package for employers – Employer Package. The package adds tons of new powerful features, especially with resume details and jobs details. Users now can easily choose show/ hide any fields which are offered in the resume detail and job page. Also, the new package gives you some new function in jobs as refresh job, allow to view candidate contact and change the number of viewing, etc. The new version will support Google Maps and free open source Bing Maps which are so useful in Job location for an exact result. Specifically, this feature allows users to search their cared jobs in an exact radius basing on their current location. In the updated version, we adding lots of new functions in Jobs listing, Companies listing, Jobs detail, Resumes listing, Resume details. You should visit the theme get these functions in details. For instance, in the job detail page, you will get some new option as sharing on social networks, applying via LinkedIn, applying via Facebook or other new functions as job follow, view more, quick view, etc. 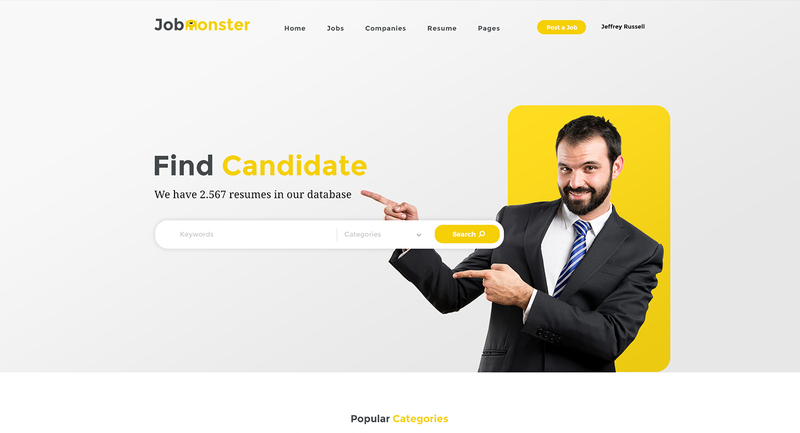 Both employers and candidates feel comfortable with Jobmonster which gives them an absolutely easy way to manage jobs as well as resumes. You can find out separate sections in the employer management dashboard including the management of Jobs, applications, messages, shortlists, advanced filter, etc. Regarding Candidate dashboard, you can easily manage Resumes, Applications, Job alert, bookmarks, follow and so on. 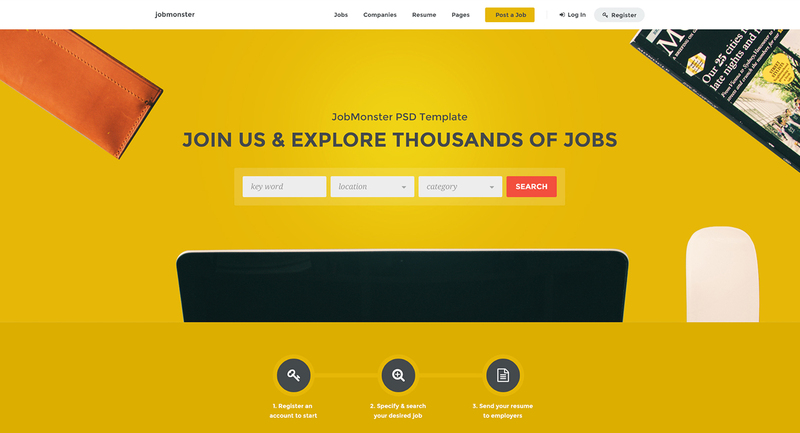 Jobmonster allows users to get the frontend submission, much easy. Employers and candidate simply submit and edit jobs directly on the frontend following submission steps and choose one is the best. Creating the high-performance job board site with distinguished functional homepage demos in minutes thanks to one-click demo importer. There are up to 9 demos option for users can choose the best suitable with your project aim (Resume, Jobs listing, search map, recruitexpert, job categories, hiring, candidate home). 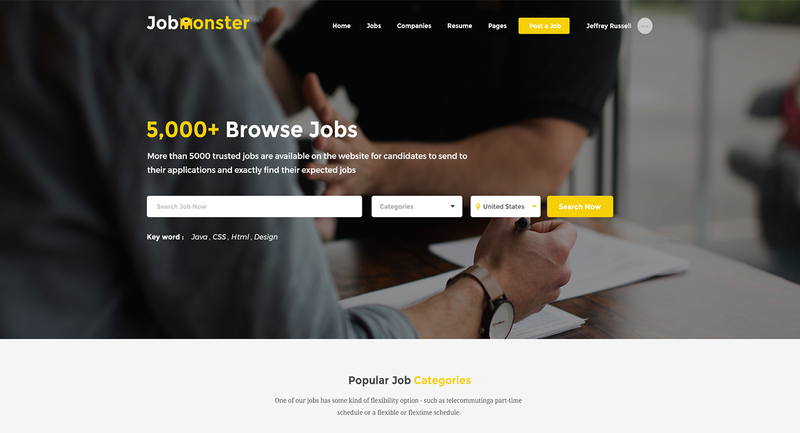 Saving the time to find out what you need in the fastest way, Jobmonster upgrades the job search and job filter on each page. Now candidates easily find the expected jobs depending on keyword, location, categories, type and so on. Both Candidates and Employers can easily find what they need with lots of specific fields in the advanced search section including keywords, location, category and you can change the search fields as your liking. The best eCommerce WordPress Plugin allows users to easily build packages, create add-ons for packages, selling packages with more payment gateways including Paypal, master card and so on. We share you the comparison about some highlight features between Jobmonster and WP Jobmanager to help you make your right decision. With the integrations of WPBakery Page Builder (formerly Visual Composer) and Slider – Revolution, you can create a stunning job board site with complete ease. Go along with unique features above, these stunning core features below also contributes to the success of Jobmonster. 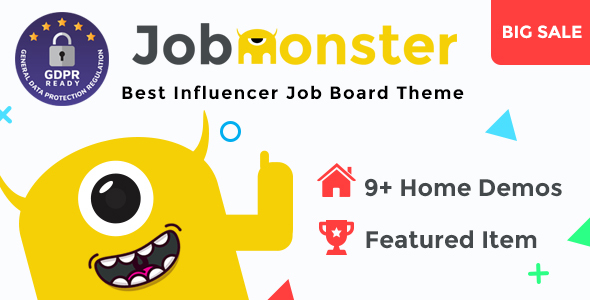 Jobmonster receives tons of praises from customers who put their trust on this job board theme for a long time. These kind words motivate us a lot to develop Jobmonster be better and better, then becoming the #1 best-selling job board theme. We would love to send our gratitude to our customers who made Jobmonster’s Day. 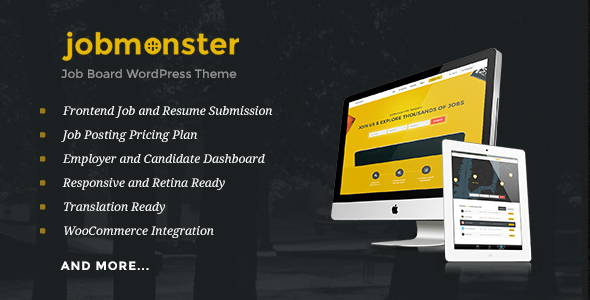 The theme integrate with Frontend PM Plugin which has private message between employer and candidate to connect them to each other and facilitate their reaction. All NooTheme themes are equipped with the super powerful Customizer. Working as the familiar original WordPress customizer, Jobmonster Customizer is much more versatile where you can configure and change settings of almost every element on your site. It is easy to use with the Custom bar on the left side and live preview screen on the right side that adjusts along with your changes in real time. Play around until you are satisfied with your website’s look and just after click Save & Publish, all the setting then will be public in the frontend. No need to shift back and forward between dashboard and frontend to see your changes and keep it private from visitors. You also can import and export your setting to use for next website using Jobmonster. The theme integrates with Indeed – the most comprehensive search engine for jobs. ReCaptcha available in Login Form, Register Form, Apply Job Form and Company Contact Form . - Resume custom field view limit. - Resume attached file download button view limit. - Resume contact info view limit. - [Add] Resume alert for Employer. - [Add] Resume featured option for Resume package. - [Fix] Order recent job shortcode issue. - [Fix] Resume listing count issue. - [Fix] Send Application without CV/Resume, error message issue. - [Fix] Company profile page - Missed portfolio info when saving data. - [Fix] Related Job - nothing found the issue. - [Fix] Warning, notice bug display. - [Check] The latest version of WP and another plugin. 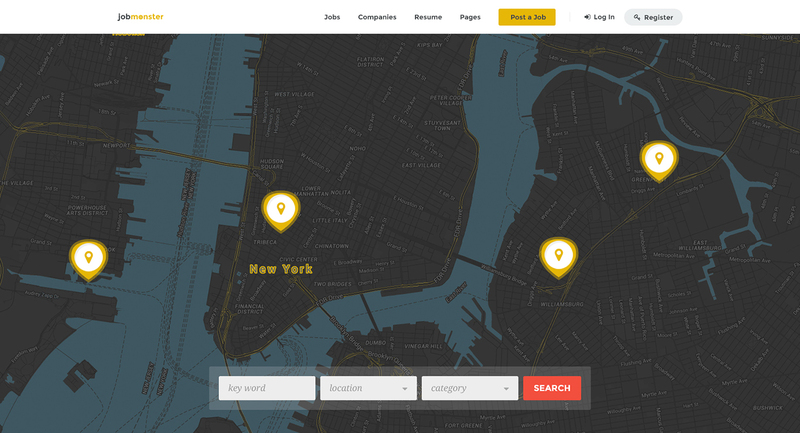 - [Add] Support Bing Map and Google Maps. - [Add] Job Search by Distance field for HTTPS website. - [Add] Custom field filter to resume management. - [Add] Resume export for admin management. - [Add] Application export for admin management. - [Fix] Empty blog page with child theme. - [Fix] Custom field view permission display issue. - [Fix] Warning message when disabling job type field. - [Fix] Custom Fields type upload at the back-end. - [Fix] LinkedIn login and Application. - [Fix] Resume grid layout: undefined offset 0 issue. - [Fix] Resume suggest query issue. - [Fix] Warning message: Warning: in_array(). - [Improve] Resume, job search field on the heading archived page. - [Fix] Remain refresh time counter issue. - [Fix] Custom field - can't change field label for Job Category, Job Tag, Job Type and Job Location. - [Add] Resume submission condition. - [Check] Style and responsive issue. - [Add] Block companies for candidate user. - [Add] Resume heading search form as job listing. - [Add] Taxonomy import from CSV, XML for Job Categories and Job Locations. - [Change] Google Sign-up and Login icon. - [Fix] Heading search form display in the job listing. - [Fix] Job alert with tag field can't save. - [Fix] Job Advanced Search vertical layout. - [Fix] Job type taxonomy - color save issue. - [Fix] Company grid style display issue. - [Fix] Editing resume with location and category field issue. - [Add] Noo Blog shortcode. - [Add] Job location shortcode to show the location. - [Add] Custom field for Job Alert. - [Add] Plural label for the custom field. - [Add] Custom HTML content for jobs listing, resumes listing. - [Add] Feed button for Jobs, Companies, Resume listing. - [Add] Refresh and clone feature for the resume package. - [Improve] Search page layout. - [Improve] User only buy the new free package after the free package is expired. - [Improve] Renew expired and publish drag job function. - [Improve] GTMatrix and google speed test. - [Fix] Select field option in the custom field. - [Fix] Job Map shortcode marker display. - [Fix] Clone/ publish clone job when the package limit. - [Fix] Clone, refresh feature on the mobile. - [Fix] Structured data warning message. - [Fix] Vulnerability about the upload file. - [Improve] Radio field select style. - [Fix] Job Follow counting. - [ADD] Add the company's custom fields to the job package. - [UPDATE][Indeed Add-ons] Improve the backfill speed by using the cache. - [FIX] Fix a glitch that force refresh the page when registering a new account with an existed username or email. - [ADD] Add option to use Page number or Load more button for job list pagination. - [UPDATE] Prevent applying when the job passed the closing date. - [UPDATE] Add read more link to make the Company description look better when there's the long text. - [ADD] Job Type Widget: add the option to show job count. - [FIX] Fix bug display Job duration days when set package can't post the job. - [FIX] Fix bug can't use select fields if add noo_job.php file to child theme. - [FIX] Fix bug new page display a wrong message when installing theme the first time. - [ADD] Add "Send message" button to the job listing on the admin dashboard. - [UPDATE] Auto creates First Name and Last Name from the Full name. - [FIX] Fix bug wrong preview job link on the notify email to send to Employer. - [UPDATE] Allow removing bookmark right on the job detail page. - [ADD] Add new info to Job package. You can now show a short description and full description of a job package product. - [FIX] Fix bug can't log in with Google+ ( there's still an issue with Edge browser on Window 10 ). - [FIX] Fix error message when deactivate/activate this theme. - [FIX] Fix bug Jobs and Resumes have quote and parentheses after editing on Admin dashboard. - [ADD] Add functions to check the theme settings. All support is handled in our Support Center. We encourage you to post all your questions concerning our theme there as your questions may have already been answered or may be of help to other people that have also purchased the theme.